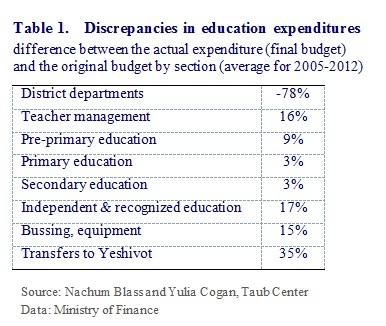 A new Taub Center study by Nachum Blass and Yulia Cogan on the education budget in Israel examined two central issues: (1) a comparison of the current education budget to education budgets in previous years as well as to education budgets in other countries; and (2) the budget’s structure and transparency – or lack thereof. The study found that the Education Ministry’s final, end-of-year, budget grew (that is, money that was actually spent) by 45 percent in real terms (i.e., after accounting for inflation) between 2000 and 2012. Even after adjusting for the number of pupils, which increased by 24% from 2000 to 2012, there is an increase in per pupil expenditure, which grew particularly quickly between 2009 and 2012 (Figure 1). The reason for this rapid growth is the implementation of the comprehensive wage bargaining agreements with the teachers’ unions as well as the accelerated implementation of the Compulsory Education Law for children aged 3-4, two processes that demanded greater spending. The comparison of the education expenditure per pupil in Israel with that of the OECD countries shows that OECD countries invest more in education at every age group – and until 2008, the gap was growing with Israel falling further behind. 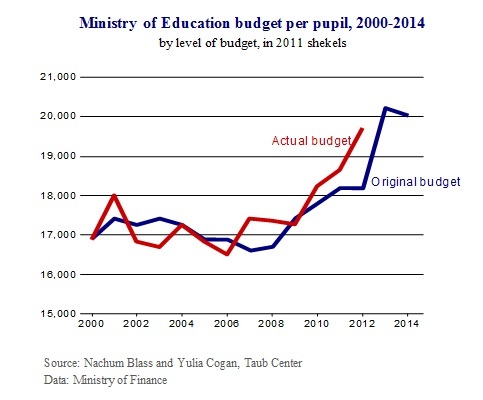 Since 2008, however, the first year of implementation of the new “Ofek Hadash” wage agreement with Israel’s primary school teachers, education spending has increased dramatically (Figure 1), while the OECD expenditure has frozen or even decreased. The subsequent “Oz Le’Tmurah” wage agreement with secondary school teachers will be reflected in the 2012-2015 budgets, while the plans for completing the implementation of the Compulsory Education Law for children aged 3-4 will be primarily reflected in the 2013-2014 budgets. Consequently, Israel’s expenditure per pupil is expected to continue rising in the next few years – both in real terms as well as relative to the OECD. As Nachum Blass notes: “During the period in question, the data simply does not support the conventional wisdom that education budgets have been cut.” Lack of transparency in the education budget The government budget, and in particular the education budget, reflects government priorities in allocating available resources. In the words of Blass and Cogan, “the budgetary discussions are supposedly open and transparent to the public, but in fact, the budget is more like a maze, even for professionals.” The study examined three levels of the budget: the original budget, the amended budget (which reflects changes to the budget during the year), and the final budget (which reflects the actual expenditures made over the course of the year). Taub Center researchers Blass and Cogan found large differences between these budgets. For example, changes in the 2012 Ministry budget included additions totaling NIS 10.5 billion as well as reductions totaling NIS 6.1 billion – i.e., total changes reaching NIS 16.6 billion, or nearly half of the budget. In Blass’s words, “the value of budgetary planning declines considerably when half of the budget is changed during the course of the year. It is important to stress that this is a multi-year average, and so these deviations from the original budget are not random but serve to reflect a budgetary policy that is clear to those in charge of the education system’s budget but is obscured (at least at the time of full debate on the original budget) from the public.” Examples of the lack of transparency in selected areas Blass and Cogan conducted a micro level analysis of budget lines, and found that, even at this level, it was very difficult to trace the spending and to determine whether actual expenditures aligned with the items specified by the Ministry of Education. For example, it was found that the budget allocated for district departments was hardly spent from 2005 to 2012 and apparently served as a sort of “hidden reserve fund,” enabling transfers to Yeshiva institutions to exceed the original budget by 35 percent (Table 1). At the budget line level, which allows for finer resolution, the same phenomena are seen. Weak populations. The goal of the Ministry of Education’s Shahar Division is to advance weaker populations and to narrow educational gaps. In the years examined, NIS 183 million was originally budgeted, though the amended budget rose to NIS 412 million, on average, for this program. The actual spending, as indicated in the final budget, stood at NIS 341 million on average. In other words, the amended budget was more than double the original budget while the final budget exceeded the original budget by 86 percent. Blass explains: “This is a pattern that repeats itself annually in certain budget line items. In the original budget – the one that is up for public discussion – a program may be budgeted much lower than the true budgetary intention. During the course of the year, significant amounts of money are then added, away from the public eye, yielding an final budget that is considerably greater than the one put forth in the original budget.” Another example of the lack of budgetary transparency is the budget item entitled “lowering the number of pupils per class.” From 2009 to 2011, the original budget allocated some NIS 218 million for this purpose, but the implementation and final budget was zero. It seems that this section essentially became a reserve budget, like others that remained unutilized until transferred and used elsewhere. Improving achievements. After the publication of improvement in achievements on the 2011 international TIMSS exams, there was a public debate about whether these achievements were the result of preparation for these specific exams or whether there was a real systemic improvement in the system. The Ministry of Education claimed that the better scores were the result of massive investment in extra teaching hours in lower secondary schools. The Taub Center researchers found, however, that although there is a “program for improving achievements” budget line for some NIS 370 million, it appears only in 2010 (the year preceding the exams) and does not appear again in 2011 or in 2012. Moreover, it appears only in the original budget, and does not appear in the amended or final budgets. Can one conclude that this budget was not utilized? Not necessarily. Blass and Cogan suspect that this budget was transferred to and used by the “general learning hours” budget line instead. Compulsory Education Law through 12th grade. In July 2007, the Knesset passed a law requiring compulsory education through 12th grade. Until 2011, however, it was not included in the education budget, at which time NIS 17 million was allocated towards it in the original budget. In the amended budget, the amount was already reduced to about NIS 1 million, while the actual spending was zero. As Blass notes: “The fact that the Ministry of Education dragged its feet for four years in budgeting the law, and in the end budgeted it with a minimal amount of money that was ultimately not utilized, speaks for itself.” Transfers to Yeshiva institutions. A particularly interesting phenomenon in these budget lines is the contradiction between the cuts in the original budget in 2005-2008 and the sharp increase in 2009. It appears that following the change of government in 2009, two actions were taken: the original budget was brought in line with the amended budget, and, at the same time, the amended budget was increased by 27 percent. In the words of the Taub Center researchers: “When the budget changes were examined, it is clear that the purported cuts between 2005 and 2008 were fictitious – since in fact both the amended and final budgets grew continuously from 2005 to 2007 and remained unchanged in 2008.” The changes were made during the course of the year, although it was clear that they were already anticipated as the original budget was being planned. Blass and Cogan note that due to negative public opinion regarding the budget to Haredi education, it was apparently easier to implement changes in the budget through the Finance Committee rather than to present them transparently in the original budget for the approval of the entire Knesset. Likewise, it was found that budget lines supporting kollels and great yeshivas stopped appearing in the budget beginning in 2008, replaced by a new budget line (support for Yeshiva institutions), at a higher amount than the two previous lines together (except for 2008). An analysis of the actual spending against the cuts in the original budget shows that, in practice, there were no budget cuts in these lines. Non-Utilization of the Budget On the one hand, the Ministry of Education is being asked to cut its budget, while on the other hand, it does not utilize the entire budget at its disposal, forgoing more than a billion shekels on average annually. This non-utilization of funds is not a one-time occurrence for a single, specific year. This phenomenon repeated itself during each of the years examined. The Ministry of Education provides various explanations for not utilizing its funds completely, although Blass and Cogan believe that with efficient management and with greater openness and transparency, it would be possible to overcome these difficulties, or at least to contain their damage. In this way, some of the transfers could be avoided – such as in the 2011 budget, where NIS 141 million was transferred from the Ministry of Education’s budget to the general reserve and from there to the Ministry of Defense for the purpose of enlisting Haredim in the army – something that is completely outside the realm of education spending. The conclusion from this Taub Center study is unambiguous: the education budget is not transparent to the public, as is evident from the substantial and systemic differences between the original budget, the amended budget, and the resulting final budget. Most of the public debate revolves around the original budget, but this budget differs, at times greatly, from the spending that actually occurs. The systematic nature of this phenomenon suggests that the original budget, in certain cases, is intentionally misleading from the outset. Likewise, the amended budget differs from the final budget and the process of budgetary modifications is very difficult or nearly impossible for the public to follow. Due to the number of changes in the budget (more than 8,000 just in 2011), the Finance Committee cannot seriously discuss each and every change. Therefore, what generally happens is that the Committee receives a list of requests for change – sometimes for large sums – and approves them without any significant discussion. The scope of requests totals an average of 20 to 25 percent of the original budget (that is, between NIS 8 and 10 billion). In order to improve the situation, Blass and Cogan recommend: simplifying the budget by reducing the number of budget sections and lines, for example, by eliminating extraneous lines which are budgeted at zero; changing the presentation of budget data to facilitate verification that budget plans matches reality; expanding the explanations to the budget; and improving the process whereby the Knesset approves budgetary changes. The Taub Center for Social Policy Studies in Israel, headed by Professor Dan Ben-David, is an independent, non-partisan institution for socioeconomic research based in Jerusalem. The Center provides decision makers, as well as the public in general, with a big picture perspective on economic and social areas. The Center’s interdisciplinary Policy Programs – comprising leading academic and policy making experts – as well as the Center’s professional staff conduct research and provide policy recommendations in the key socioeconomic issues confronting the State. For details, or to arrange an interview, please contact Gal Ben Dor, Director of Marketing and Communications 054-464-2333.